"KTM has started offering the Duke 390 to the media and the first ride event has taken place in Austria, the home of KTM. The 390 Duke is not only awaited in India, but in many global markets too, where enthusiasts are waiting to get their hands on this value for money performance machine. While most of the cycle parts of the Duke 390 are similar to the Duke 200 and Duke 125, the heart of the matter is different, which changes the complete characteristics of the bike. Can’t wait to know how the Duke 390 performs? Read the interesting points below, which give a fair picture about the performance of the KTM 390 Duke. * The 390 Duke is relatively smaller in size compared to the engine it is powered by. * The Duke 390 is quite agile and easy to ride and handle, thanks to the low dry weight of 139 kgs. * The Duke 390′s 373cc engine will entertain most experienced riders but low end power is only average. * One needs to rev past 5000 RPM to extract the best from this engine. * Engine sound at idle is quite disappointing, but gets better as the revs increase. * There is an adjustable shift light on the console, which is similar to its siblings. * Mid-end to high-end thrust is excellent, redline comes in at 10,500 RPM. * 0 – 100 km/hr takes around 5 seconds, top speed is 171 km/hr (speedo indicated). * The Duke 390 is frugal and returns an average mileage of 30 km/l. * Metzeler Sportec M5 tyres offer good levels of grip. Indian Duke 390 might get MRF rubber. * 10 mm lower seat height than Duke 200 (800 mm on the Duke 390), riding position good for 6 footers too. * The trellis frame is finished in orange, so are the alloy wheels. * There is small amount of vibrations at high revs and the suspension is on the stiffer side. * Front visor offered as option, which reduces wind blast at speed. * Braking is good and ABS works well. 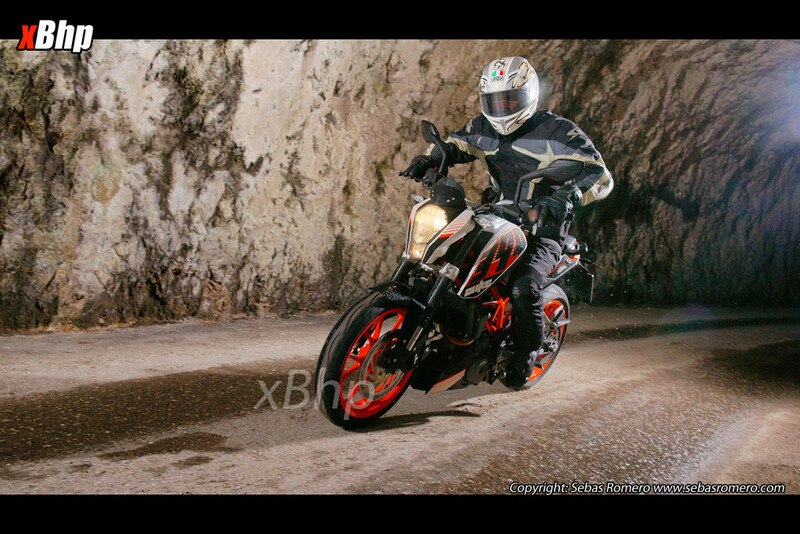 The initial reviews of the KTM 390 Duke are very positive. The motorcycle is all what we expected it to be – fast, easy, fun and frugal. The Duke 390′s engine uses forged pistons and NiKaSil coating and produces 44 HP of power and 35 Nm of torque. The rev limit is placed quite early so tuners will take advantage of increasing it, resulting in top speed increasing to around 180 km/hr. Bajaj Auto will launch the Duke 390 in the Indian market by June 2013, offering it at an on-road Mumbai price of Rs. 2.5 lakhs. ABS is going to be standard. The KTM Duke 390 is priced at Rs. 3.57 lakhs (€4995) in Europe." Over the past two years I have rebuilt my XT500, and last week I was finally at the point where I could make the first test run. It is still very uncomfortable, but a lot of fun to ride. Not a lot is standard anymore: I swapped the front end (SR forks, TZ750 wheel, FZR disk, LTD440 calliper), made a new wiring loom and voltage regulator (no battery needed anymore), homebrewed exhaust, peg mounting plates, new rear brake mechanism, headlight frame, K180 loops, modified and delugged frame, have rebuilt the engine and probably more that I can't remember at the moment. This winter I finished the bike and had the tank and seat painted by Custom Painting Holland in Amerongen. They did a great job! 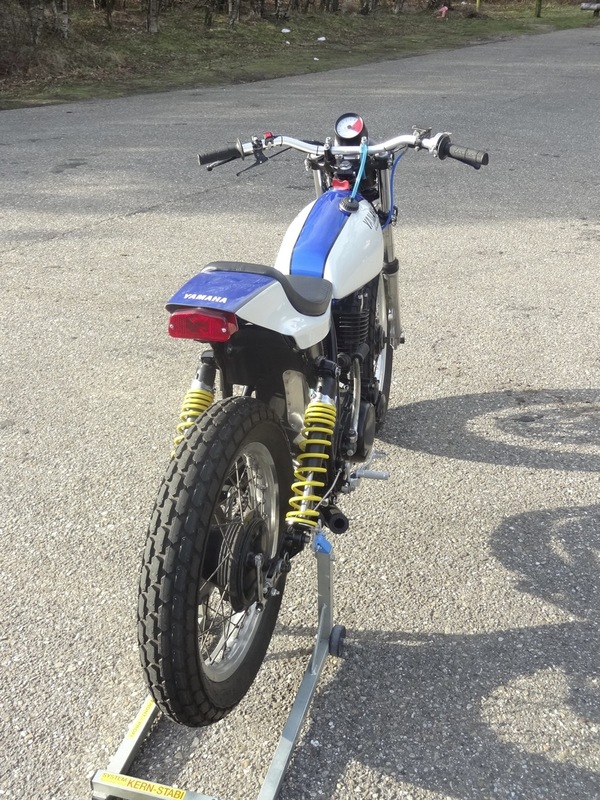 Inspired by the famous XR750, this is my little flat tracker. As a reference to the flat track scene, I named it the Quarter Mile. Hope you like it. This is probably the best looking XT500 In the Netherlands right now, what a cool build. The handle bar, tachometer, headlight combination is PERFECT! There is a very, very small chance we will see this bike at Rusty Gold this year but Erik has other plans on the 5th of May. Thanks Erik, stunning transformation, I love this bike. Stop teasing me guys, I wanne be in Biarritz right now! So who's planning to go? My plan is to leave a few days before it starts so I can take my to time reach Biarritz on my GR650. Zigzagging France and avoiding the big highways.